AN UNRIVALLED BILL OF MUSICAL DELIGHTS !! In 1969 Andy answered an ad in Melody Maker magazine, and found that Martin Turner and Steve Upton were looking for a guitar player. In fact, they ended up with two; being unable to decide between Andy and another applicant named Ted Turner, they took both. The new band, named Wishbone Ash, managed by Miles Copeland, was on its way. They released their first album, “Wishbone Ash,” in 1970. Wishbone’s third album, “Argus” (1972), was named “The Best British Album of the Year” by Melody Maker, and Andy himself appeared in the guitar polls of many 1970s British music papers. Throughout the years, he has been featured in notable publications, including Guitar Player, Vintage Guitar and Guitarist, and has appeared at the Guitar Institute in Los Angeles. He has worked on sessions for George Harrison, Ringo Starr, Kashif, Stewart Copeland and Renaissance, among others. His instrumental compositions have been used as themes for radio and TV (including the US’s “Today Show”) and for the World Soccer Cup. In 1988, Andy and Ted Turner joined Miles Copeland’s “Night of the Guitar” tour, which featured other guitar legends like Randy California, Jan Akkerman, Peter Haycock, Steve Howe, Steve Hunter, Robbie Krieger, Leslie West and Alvin Lee. By 1995, Andy was the only original member of Wishbone Ash. His commitment to maintaining the band’s legacy has been evident in performance of new and classic songs on frequent tours of Europe, the UK and the US. He is at once a caretaker of the past and a commentator on the present scene: driving a musical machine that is always moving forward. 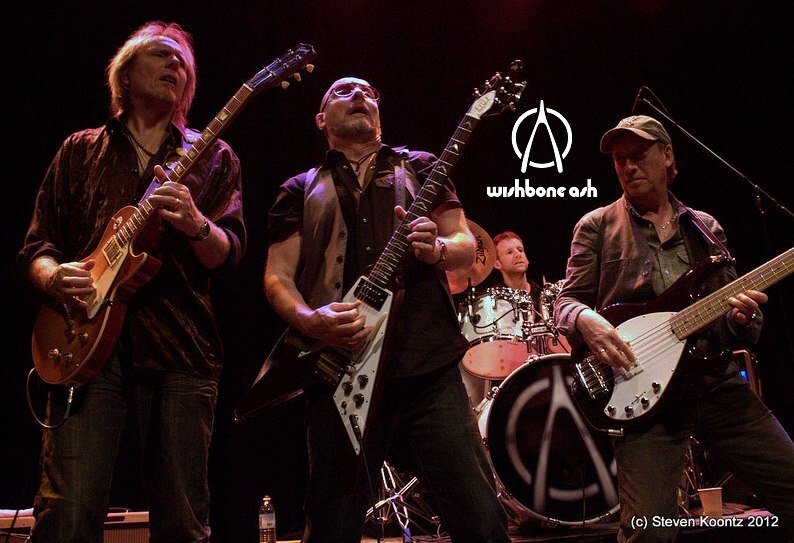 Now, in his 5th decade in Wishbone Ash, there is a lot to celebrate: a musical resumé that includes more than 30 albums and several DVD performances, and the appreciation of thousands of fans worlwide. Bob Skeat Bass Guitar. From the late ’80s, he has played with Colin Blunstone, Princess Stephanie of Monaco, Gilbert O’Sullivan, Hazel O’Connor, Chris Farlowe and Toyah Willcox. All along, he has done sessions with other bands and recorded TV ads and radio jingles. Recently, Bob and former Wishbone Ash guitarist Laurie Wisefield have been performing in the hit musical, “We Will Rock You” . Finnish guitarist Jyrki “Muddy” Manninen joined in 2004. He brings a bluesy style to the band. With Muddy, Wishbone Ash regains a slide guitarist. Through the years, Muddy has played with many Finnish artists, including: Hector, a singer-songwriter who’s been around since the mid ’60s; Pave Maijanen, a talented singer who can be heard singing background vocals on several Wigwam albums (Finnish prog-rock); and Riki Sorsa, the Finnish Rod Stewart. Joe Crabtree joined in 2007. Performing in an impressive range of contexts over the past 15 years, Joe is a powerhouse player who excels in most major styles of drumming, from progressive rock to jazz. The dynamic musician also drums for Pendragon and the David Cross band, teaches at the Academy of Contemporary Music in Guildford, U.K., and records studio sessions and custom drum tracks. THIS IS ONE HELL OF A BAND. A unique one man blues band, Steve really has to be seen live to be fully appreciated. The video for his single “Dangerous” on YouTube has won him a whole new army of fans.